Butterworth Shah Alam Butterworth Terminal (Penang Sentral) Shah Alam Bus Terminal Section 13. Bus from Butterworth to Shah Alam is the important public transportation in connecting people in two areas. Many people rely on this bus service because there is no direct train and flight service available from Butterworth to Shah Alam. By taking train or plane, passengers would have to transfer train, bus or taxi from the airport or bus terminal in Kuala Lumpur to Shah Alam. 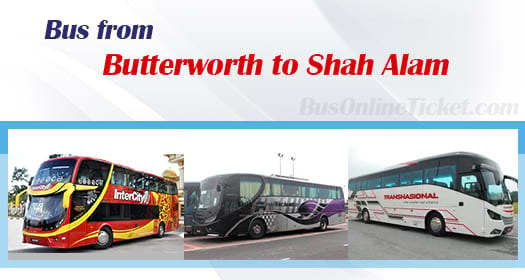 Hee Enterprise, Intercity Coach, Jasmine Express, Eltabina Express and Transnasional are few bus service providers offering bus from Butterworth to Shah Alam. Pacific Express is the largest player among the rest by having up to 3 daily trips. Most bus operators are deploying VIP coach to serve passengers. However, Intercity coach is operating this route with luxury High Deck VIP coach. The bus journey from Butterworth to Shah Alam is about 5 hours depending on the road traffic condition. Please note that there is no toilet on board in all Malaysia's buses. Therefore, bus driver will provide short washroom break along the highway. The bus fare from Butterworth to Shah Alam is reasonably priced in a range of RM 36.70 to RM 45.00 depending on your selection of bus service provider. Jasmine Express offers child fare at RM 31.50 which is beneficial to passengers travelling with children. The boarding point for bus going to Shah Alam from Butterworth is located at Penang Sentral Bus Terminal. The arrival point in Shah Alam is located at Shah Alam Bus Terminal. Booking your bus ticket from Butterworth to Shah Alam with BusOnlineTicket.com is very simple, easy, and reliable. You are advised to book your bus ticket online to avoid any hassle from travelling all the way to bus terminal just to buy a ticket over the counter. Instant confirmation email will be sent to you upon the payment is successfully made.